A dedicated vihuela chord book, in English and Spanish, with over 300 chords for the vihuela. Chords are presented in easy to read and understand chord diagrams. Exact fingerings are shown for each diagram. Chords shown include major, minor, 7, min7, maj7, b5, sus4, aug, dim, 6, m6, 6/9, m7b5, 11, 13 and many more. 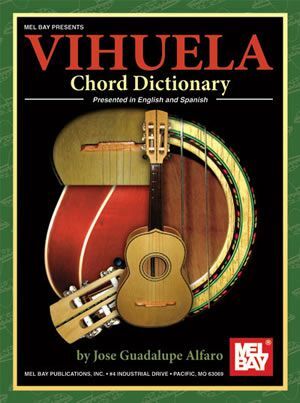 Mel Bay’s Vihuela Chord Book is one of the most comprehensive on the market, perfect for the aspiring mariachi.